The tweeter employed the dubious practice of “quoting” but not referencing, so of course we don’t know from where he got this. An enquiry was met with impudence. As is so often the case with really wild claims, the tweeter appeared to have some personal integrity issues. Of course Constantine said nothing of the kind, as I hope we all know. This is purely fiction. But … where from? I quickly discovered a possible source: In His Name vol. 4, Trafford Publishing, 2014, by E. Christopher Reyes, whose interminable litany of factual errors, combined with no little spite, included this on p.273. The reference given was “God’s book of Eskra” (?) op. cit., chapter 48, paragraph 31. But according to this website all this material was to be found in an article by the renegade church minister Tony Bushby in Nexus magazine in 2007. This indicated that “God’s book of Eskra” was “God’s Book of Eskra, Prof. S. L. MacGuire’s translation, Salisbury, 1922”. Bushby went on to produce a book, The Bible Fraud, and you can’t argue with the title. He seems to have faded from view since. A little investigation revealed that this “Book of Eskra” is a 19th century modern apocryphon called Oahspe: a new bible. In fact I have written about Bushby and this very work here, with a link to chapter 48 of this fake text here. Clearly the tweeter was quoting some version or other of the Oahspe fake, although indirectly. It’s permissible to wonder what kind of person fills his head with nonsense of this kind in these days, when the raw data is ever so accessible. Poor souls. Posted in From my diaryTagged hoaxesLeave a Comment on The very words in which Constantine ordered the bible to be assembled? The strange, odd Oahspe hoax. I’m currently translating John Gray’s booklet ‘Seven types of atheism’ into Dutch. On p. 17 Gray cites this line from Augustine’s ‘Pamflet against the Jews’: ‘The true image of the Hebrew is Judas Iscariot, who sells the Lord for silver. The Jews can never understand scripture, and forever bear the guilt of the death of Christ.’ I cannot find this line in your translation. What could be the matter here? The gentleman is not the only one to wonder. Anti-Christian quotations of the fathers are nearly always misquotations or frauds, as I discovered long ago when I reviewed a book of them. At this point I must make a brief but significant detour. Not infrequently Jerome’s and Augustine’s names are mentioned on the internet as outspoken propagators of Christian anti-Semitism. On a number of websites Jerome is quoted as having said that the Jews are “Judaic serpents of whom Judas was the model”, and also: “They (the Jews) are serpents, haters of all men. Their image is Judas. Their psalms and prayers are but the braying of donkeys”. However, when I checked the quotations against the original, I could not trace their provenance. Virtually all authors quote these words without mentioning the exact source. There is a passage in Jerome’s commentary on Amos that comes close to it (“iudaeorum quoque oratio et psalmi, quos in synagogis canunt, et haereticorum composita laudatio tumultus est domino, et ut ita dicam, grunnitus suis et clamor asinorum, quorum magis cantibus israelis opera comparantur”),54 but the very references to serpents and to Judas are conspicuously absent. In his Verus Israel, Marcel Simon does quote the words of Jerome with a source reference, but he refers to Migne’s Patrologia Latina 26:1224, which is clearly wrong. It seems that we have here a clear example of a “fake quotation” that is running a life of its own. I suspect the same is true of two anti-Semitic quotations not seldom attributed to Augustine that I was unable to trace: “The true image of the Hebrew is Judas Iscariot, who sells the Lord for silver. The Jew can never understand the scriptures and forever will bear the guilt for the death of Jesus’, and “Judaism, since Christ, is a corruption; indeed Judas is the image of the Jewish people: their understanding of Scripture is carnal; they bear the guilt for the death of the Savior, for through their fathers they have killed Christ. The Jews held Him; the Jews insulted Him; the Jews bound Him; they crowned Him with thorns; they scourged Him; they hanged Him upon a tree”. All this is not to say that Jerome and Augustine did not articulate anti-Semitic sentiments (they clearly did) nor to deny that they may have said things to that effect, but such allegations need to be corroborated by meticulous research and sound evidence, especially so in cases with such wide-ranging implications. 54. Jerome, Commentariorum in Amos; CCSL 76:2, LLT 589. 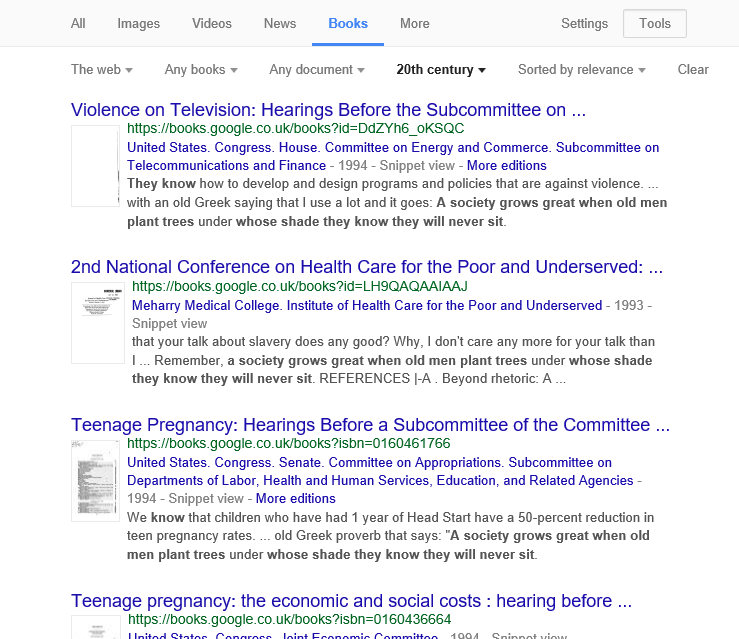 My own search revealed no source. No doubt there is one, at some remote remove. It may perhaps turn out to be someone’s summary of what they felt Augustine intended. Along with the collected letters of Cicero, the memoirs written by Caesar while he was conquering France and other areas of central Europe in the fifth decade of the first century BC is believed by many to be one of the few manuscripts to have survived the period. But there is a very good chance that Caesar’s ‘Commentaries’ did not survive, and that ‘Bellum Gallicum’ (BG), the title it is known as today, was the work of other writers. Historians are wrong to treat it as gospel and to suppose this was the true voice of Caesar. But many do, and therefore they duly accept that he invaded Britain. The basis for this? That the earliest manuscript of the BG is 9th century, “coinciding with Alfred’s life”; that Caesar “lapses” into first person in the BG; “120 examples of Alfred’s idiosyncratic writing style”; 40 references to Alfred himself (which a forger would naturally introduce into his work); and so on. But curiously I can’t find any other source for this story. Nor can I find any sign of a Rebecca Huston, associated with National Geographic. Which is more than odd, all by itself. A glance at Texts and Transmissions reveals that the Bellum Gallicum is transmitted by two families of manuscripts, both with a 9th century exemplar. The first was written at Fleury in the second half of the century, the other at Corbie in the 3rd quarter of the century. The first family contains mainly the BG; the other contains all the commentaries. Neither manuscript is British or associated with Britain, as far as I can see. As for the other evidence, I must defer to specialists. But I have long since grown wary of such claims. Sifting fernseed seems to be bad for the eyes, in altogether too many cases. Fascinating to see a claim like this, where there seems no discernible motive. Or is it simply a silly-season invention by a journalist? UPDATE (28/8/17): After writing this, I dropped an email to Ben Hamilton at the Copenhagen Post, who replied very promptly and helpfully, and made clear that the story is genuine. He gave this link at IMDB for Rebecca Huston. I have since also received some emails from Rebecca Huston. It will be interesting to look further into this one. Posted in From my diaryTagged hoaxes9 Comments on Did Alfred the Great invent the story of Caesar invading Britain? This, we are told, is a Greek proverb. The sentiment is unexceptionable, but readers of this site do not believe attributions without evidence. Is this truly ancient? If so, how do we know? 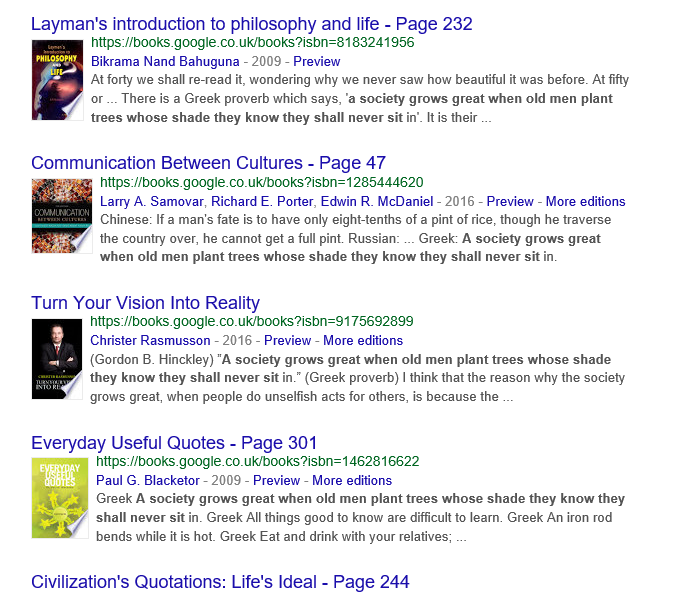 The “old Greek proverb” is hardly heard of before 1993, although I saw a quote in The Nation in 1991. A man has made at least a start on discovering the meaning of life when he plants shade trees under which he knows he will never sit. This is only visible in snippet view. But this version of the saying takes us further back yet. It is associated with a David Elton Trueblood (or D. Elton Trueblood), a Quaker, in 1955. At her departure, we are reminded of the passage from Elton Trueblood’s The Life We Prize, which she so often quotes: “One has to come to the full meaning of life when he is willing to plant shade trees under which he knows full well he will never sit…. That, I suspect, is the real origin of the proverb – a volume of moral writing by a quaker in 1951. The aphorism then trickles through popular magazines, changing as it goes. Ronald Reagan uses it in 1983. But it seems to become a “Greek proverb” only in the hands of US congressmen in 1993. Posted in From my diaryTagged hoaxes19 Comments on “A society grows great when old men plant trees in whose shade they know they shall never sit” – an ancient Greek proverb? Anyone who attempts to construe a personal view of God which conflicts with church dogma must be burned without pity. These kinds of “quotes” are often derived from opinions by modern writers, which someone has then turned into a quote by the object of the opinion. And so it proved; it was a quote from Peter Tompkins, The Magic of Obelisks. But a correspondent then pointed out that the phrase appeared earlier, in the English translation of a book by Frenchman Maurice Magre, in 1931. The US title was “Magicians, Seers and Mystics”; the UK title “Return of the Magi”, London, 1930. This I have now obtained, and as it is public domain, I have uploaded it to Archive.org here. And indeed this is correct – on p.60, our “quote” appears. Three terrible figures dominate the great Albigensian massacre. For the massacre to be possible, it was necessary that an extraordinary genius for violence, for organisation, and for hypocrisy, should take shape in three men, who were all equally devoid of pity and, possibly, equally sincere in their hatred of heresy and love of the Church. It was Pope Innocent III who, with obstinate determination, desired and decided on the crusade. The murder of the papal legate Pierre de Castelnau was only a pretext. Historians are unanimous in gloryifing this pope. To them the great men of history are men who do something, who have a powerful will and exert it to attain an aim. It makes no difference whether the aim is sublime or abominable; it is success in attaining the aim which gives the measure of genius. As soon as he was elected pope, in all his public utterances Innocent III began to talk of ” exterminating the impious.” It was the dominating idea of his life, and he realised it wholeheartedly. He had a deep-rooted conviction that any man who attempted to build up a personal view of God which conflicted with the dogma of the Church must be burned without pity at the stake. No reference or source is given for the claim. The author appears to be an occultist. A chapter is devoted to the supposed origins of Rosicrucianism, recited uncritically; another to a biography of Apollonius of Tyana, equally uncritically given. The prose style of the author is that of a historian; the content is nonsense. With luck, this is the final origin of this striking phrase. 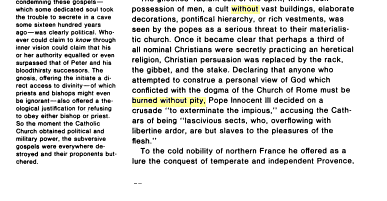 Posted in From my diaryTagged false quotes, hoaxes, Innocent III4 Comments on “Burned without pity” – the fake quotation taken back to 1930! While looking for some information on the Spanish Inquisition, I came across a whole slew of pages containing the following quotation (various, but here). However that bull seems to be Vergentis in senium, as mentioned here. The Latin text for the bull is at IntraText here. Using Google Translate gives a very good idea of the contents, and this is not in it. This plainly is the source of the quote. And … it is not a quote at all. It is a summary, by Peter Tompkins, of what he believes that Innocent was saying, in some unspecified text. Whether it is a fair summary or not I could not say; there is, as we can see, no footnote on the paragraph. Whether the supposed verbatim quotations are in fact accurate we cannot tell, but I have my doubts about these also. Tompkins himself was a journalist, who lived long enough to have a web page, full of crank stuff. It’s not my purpose to look into medieval history, but at least to identify this particular quote as false. UPDATE (6 March 17): In the comments, SuburbanBanshee draws our attention to the fact that Tompkins is actually quoting a 1931 book by Maurice Magre. I find in Google Books snippet that the phrase appears on p.60 of “Magicians, seers and mystics” (Dutton, New York, 1932: snippet here). It doesn’t seem to be a quote there either. According to a bookseller, the UK publication was “The Return of the Magi”, London, 1931, translated from the French “Magiciens et illumines…”, 1930, by Reginald Merton. The latter title has been reprinted in 2016 – I assume it has dropped out of copyright. I have ordered a copy and we will see what it says. UPDATE (28 March 17): I have now obtained the book and discuss it here. The Oldie magazine is probably read by few of us, being mainly for people who are, well, old. A correspondent has sent me a copy of an article in this week’s issue, written by the editor, Richard Ingrams. We love a spot of academic intrigue and so were delighted to receive an email from one Dr A D Harvey. Harvey, who describes himself as a ‘failed academic’, won notoriety after publishing academic articles under various pseudonyms and inventing a meeting between Dickens and Dostoevsky that fellow academics accepted as fact for years. American scholars finally uncovered the hoax and Harvey became the subject of a six page take-down in the Times Literary Supplement. Most would suspect that Harvey himself had a hand in the Hans Christian Andersen hoax, if indeed the alternative ending proves to be fake at all. But Harvey claims it bears none of his modus operandi — not that we can really take his word for that. One thing we can be sure of: the TLS fact-checkers will be frantically searching for evidence of the Hackney manuscript and hoping that Dr Harvey has not been able to spectacularly settle his score with their scholarly journal. The urge to twist the tail of the spectacularly aloof and patronisingly self-important is one that is probably common to most of us. In this sense the activities of Dr Harvey are something that most of us will feel sympathy with. Until we find that our own research has been compromised by such pranks, at any rate. Verifying the raw data is never time wasted. The internet has given new life to some old hoaxes. The idea that Jesus visited India and left otherwise unknown gospels there was advanced by a certain Notovitch in the 19th century. I have just seen it appear again, all innocent and oblivious of criticism, in a crank discussion forum here. Long ago I scanned some articles from Nineteenth Century magazine, in which the efficient British administrators of India went and interviewed the Tibetan lamas, with whom he supposedly communicated. Rereading that article, I found references to other hoaxes in Max Muller’s comments. Be that as it may, M. Notovitch is not the first traveller in the East to whom Brâhmans or Buddhists have supplied, for a consideration, the information and even the manuscripts which they were in search of. Wilford’s case ought to have served as a warning, but we know it did not serve as a warning to M. Jacolliot when he published his Bible dans l’Inde from Sanskrit originals, supplied to him by learned Pandits at Chandranagor. Thanks to Google books, Mr Jacolliot’s book is available to read here, in the 1875 English translation. The table of contents alone raises suspicions: long chapters on subjects like “Christian morality”, of no evident relevance, pad out the volume. For as we know, most of these hoaxes are published for money, and a long book can be sold for more. Sadly, after reading some 50 pages, I was unable to induce myself to read more. The animosity of the author against the Christians was only equal to the vagueness of his rhetoric. We must congratulate Dr Muller, that he managed to find something of substance in all this.